The animal kingdom is thriving on the Internet, as we've witnessed with folks' interest in virtual pets. Whether they're buying cows at Farmville or laughing out loud at the hilariously inane cat site known as "I Can Haz Cheezburger," animals occupy as much of our time online as they do in the real world. To that mix, you can now add those furry little nut-snatchers who have squirreled their way into our hearts and minds, over the course of the last couple of years. Yes squirrels are definitely of interest to us humans and their omnipresence have captured our imaginations in a couple of unique ways online. For instance, back in '09, CNN was one of the first to report on the "Crasher Squirrel" meme phenomenon. 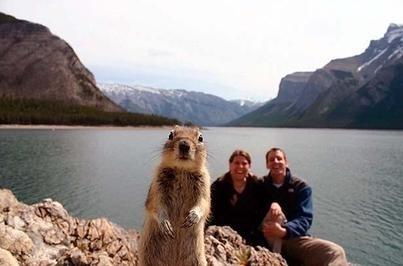 As the story goes, when Melissa and Jackson Brandts took a vacation to Lake Minnewanka at Banff National Park in Alberta, Canada in May 2009, they were surprised to capture a Golden-mantled Ground Squirrel in one of their photos. While the couple were posing on rocks next to the lake using a camera with a wireless remote shutter release to take photos of themselves, a photogenic squirrel appeared to want his picture taken as well. He stood upright smack-dab in the middle of the frame, allowing the Brandts to capture him on film that many later thought had to be photo-shopped. Crasher Squirrel - 1st Sighting! So when questions arose as to the photo's authenticity, Today Show's host Matt Lauer was able to discern the single photo was legitimate and one of a set of that had been taken off of one roll of film. When picked up by National Geographic's November of that year, The Brandts readily realized what type of sensation they had ignited. Soon dubbed "Crasher Squirrel," online the meme went viral with even a Wikipedia page dedicated to the phenom. A website called "The Squirrelizer", was created by Graeme Hawker of Scotland to allow anyone to add the image of the squirrel to any photo . 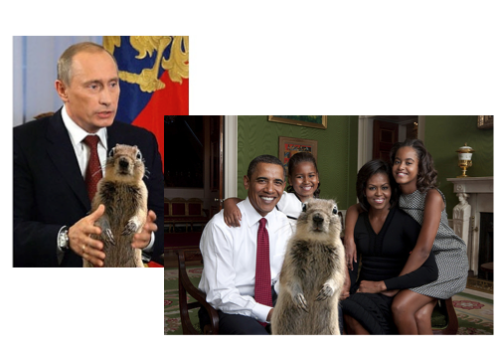 . . where even Russia's premier Putin and the Obama family appeared to want in on the joke. Squirrels ha ve also entered the zeitgeist of the online financial landscape of Empire Avenue. First launched in February, 2010, this Canadian start-up can be described as a revolutionary online influence stock exchange network game that allows users to buy and sell shares of each other and their brands. It combines the investment mechanics of a stock market with the interconnectedness of a social network. Well. . . as this story goes, back in August, 2010, rumors began to circulate that EA's CEO, Duleepa "Dups" Duleepa "Dups" WijayawardhanaWijayawardhana and his inner circle had engaged in the nefarious practice of employing interns from the animal kingdom, mainly squirrels. However according to the online pub, The Influencer which covers the daily workings of EA regularly, they learned early on that there was a general discontent by the animal workforce as to their working conditions in the server room, describing them as "despicable," particularly when one of the interns was said to be sequestered in a cage. That same week, a rascally rodent by the name of Sir Rudiger Esquirel who used to trade on EA with the handle (e)SQRL threatened violence on the company lashing out that "As Empire Avenue forces me into manual squirrel labor. . . I will unleash my vengeance upon them in a hail of nuts and squirrel droppings." From that day forward, EA members have used this tongue-and-cheek fable to criticize EA the times their share prices and/or dividends take a dip. For all intents and purposes, Sir Rudiger and his band of discontents are the go-to "fall guys" to blame for infiltrating EA's algorithm, permitting their virtual fortunes to run amok. However, from the lofty position of the powers-to-be, it's still a love-hate relationship and when the CEO needs a helping hand, he often does reach back to his unruly intern to get the job down. This was brilliantly demonstrated last year when EA was up for the 2011 Mashable Awards, and they needed a spokesperson to plead their case for votes. . . yes, you guessed it, Sir Rudiger put aside his grievances to step back into the spotlight to support the one company he can't seem to fully extricate himself from. You gotta love him! Long live Sir Rudiger! Dancing Kitties! The Animal Video of the Day!! !